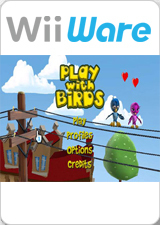 Play with Birds is an original cartoon bird game for players of all ages, offering a unique experience playing a bird. Fly through the city, accomplish dozen of bird minigames, including Birdman, Catch Thief!, Bird race!, and others. Become famous and find a bird to build a nest with! Play with Birds is focused on adventures of a small bird in a city during his lifetime—starting from hatching from the egg and continuing on to finding a partner to build a nest and establish a family with. Accomplish minigames, become famous in the bird community, build a nest, and create a family! The graph below charts the compatibility with Play with Birds since Dolphin's 2.0 release, listing revisions only where a compatibility change occurred. This page was last edited on 22 January 2018, at 04:56.